Breaking the Bank: Not An Ordinary Day!! Today is a special day! I know that it seems like your average Tuesday but it isn’t. 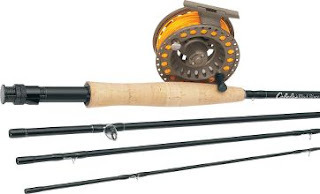 You see after talking to a couple of folks I decided on a specific fly rod to purchase. It was on sale and this morning I found out there was also free shipping on rods and reels over at Cabelas (go check it out!). So I finally made the decision, placed the order and in a few days I will be receiving my first Fly rod and reel combo! As I have heard a few say, I am crossing over to the dark side! Anyway, I am hoping to receive it as of next week so I will keep you posted. Hopefully it gets here sooner! I feel like a Child on Christmas! In some other news, Tomorrow I will go salmon fishing with my buddy Sean. Sean is a seasoned salmon angler so (I believe) he knows what he is doing! I will be up and out at 5:30 am so hopefully we will hook into something tomorrow. As always, I will keep you guys updated. Here’s hoping that I meet another goal tomorrow and get into my first salmon ever!! Hey, don't be hatin' on that reel, bro! I will have you know that reel has stopped a massive 30lb carp and plenty of salmon for my friend! They are amazing reels for the price! the rods aren't bad either! Hey Samuel, Welcome to the blog! I was not hating on the reel AT ALL! haha I was told it was a great reel and by your words I am guessing you are confirming this. What i meant is that i know absolutely NOTHING about fly reels so anything i say will be a guess and therefore won't make any sense! lol I'm glad to hear it can slow down a 30 lber because eventually i will be trying to catch them 30 lbers! Thanks for your comment, man! Salmon on a fly rod? I watched a guy hook one on the American with a 6wt and all he did was stand there. He couldn't move the thing. Hopefully Sean has something a bit larger. Ha Ha my apologies! I didn't mean to write fly rod! It was just regular fishing! lol Thanks for pointing that out, mark! Yup, you are right! Now you have gone and done it. The "Dark Side" is very, very addicting. So hope you can handle the ride! Good choice on gear to get started with. Hey Mel, I hope I can handle the ride too. I already have a list of all the fly fishing spots i will be visiting in the near future! I can't wait! I landed four small trout the first time I went fly fishing and that is exactly why I purchased the fly rod... I am totally hooked! haha I will use this rod to slay some big trout and hopefully even some bass! Thanks for reading, Bill! Hey J, I don't know much about your rod and reel combo but I do know that it's all down hill now. One piece of advice, stay away from Tenkara...now that's really addicting. Hey Howard, haha after buying flies for the first time, i know it is definitely down hill! haha I tried Tenkara once it was a good time! Thanks for reading! I like my WR3 reel and have a WR2 on the way to match my GLoomis 5 wgt. The WR3 matches my GLoomis 8wgt very well.